The fourth chakra is at the center of the seven chakras with three below and three above. This is the area where physical and spiritual meet. The fourth chakra, also referred to as the heart chakra, is located at the center of the chest and includes the heart, cardiac plexus, thymus gland, lungs, and breasts. It also rules the lymphatic system. 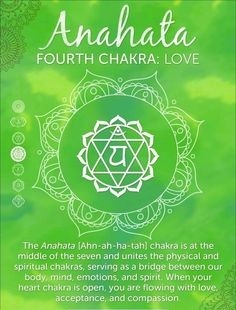 The Sanskrit word for the fourth chakra is Anahata, which means “unstruck” or “unhurt.” The name implies that beneath the hurts and grievances of past experiences lies a pure and spiritual place where no hurt exists. When your heart chakra is open, you are flowing with love and compassion, you are quick to forgive, and you accept others and yourself. A closed heart chakra can give way to grief, anger, jealousy, fear of betrayal, and hatred toward yourself and others. Some people choose to live in the place of grievances. They’ve been hurt in the past by parents, siblings, classmates, or loves. Maybe you’ve been there too. It’s impossible to avoid situations where someone may try to hurt you. But you get to choose what to do with that hurt. Some people might try to hurt the other person back. Yet, that is not living from a place of Anahata. The person who inflicts pain on others is coming from a place of fear, ignorance or hatred, all of which represent a closed heart chakra. When you encounter hurt feelings from your past or present, you can choose to feel them fully and let them go or hold onto them. By letting them go, you’re able to open your heart to new people and new experiences with compassion, love, and understanding. Holding onto hurt harbors negative feelings and cuts you off from opportunities to love and serve. Letting go is as easy as making a choice. Your mind and your ego may tell you otherwise but it’s as simple as choosing to let go and move on. Walking in another person’s shoes is not easy to do, but can be helpful in fostering a sense of empathy. To help create empathy and compassion, I like to play a game called, “the what if scenarios.” When encountering a person who is being unpleasant or who has treated me poorly in the past, I quickly take my mind through a host of what ifs. For example, ask yourself, “What if that person is just having a bad day?” or “What if that person just lost his job?” “What if she just learned her husband was having an affair?” “What if he was just diagnosed with an illness?” As you create these stories, of which the possibilities are endless, you begin to empathize with the other person and his or her situation. This method takes you away from yourself and self-pity and places compassion onto the other person. Now, let’s suppose that there’s a family member or close friend who just repeats a pattern of inflicting hurt on a constant basis. You can still offer love and compassion either from a distance or by setting boundaries. In any case, know that when someone chooses to hurt you, it’s almost never about you. It’s about them. Smile at everyone you see daily, even if you don’t feel like smiling. It’s contagious. Forgive and move on. Life is too short to hold grudges. Give friends, family and co-workers positive affirmations and feedback. Try to go one day a week without criticizing anyone or anything, including yourself. Take any opportunity you can to foster love and loving feelings. Love is a currency and whatever you give will come back to you. Any yoga pose that opens the area of the chest will help to balance the heart chakra. Some poses include camel, standing bow pose, and cow face pose. The mantra sound corresponding to the fourth chakra is the sound YUM. A special mantra to help expand love and compassion is OM MANI PADME HUM. You can repeat this mantra in meditation to gain greater access to these qualities. The color is emerald green and the gemstones associated with the heart are emerald, malachite, jade, and rose quartz. This is the fifth article in a series written by Michelle Fondin for the Chopra Centre.